As the New Year begins, we look forward to reinventing and improving upon last year’s version of ourselves. Resolutions have never been something I subscribe to. I like to research the latest and greatest and then consider how they might make my life better, healthier, easier and implement the ideas born out of necessity. I look at home decor trends in much the same way. Redecorating each year with the latest color or style is a bit unfulfilling and like the diet that only lasts 2 weeks post-resolution, so too will your love affair with all things pink or patterned. Some trends develop more organically because it’s something a lot of us either want or need and those are the trends that offer up innovative new products or smart approaches to how we use and live in our homes. Home décor style trends are often closely tied to fashion and this year is no different. 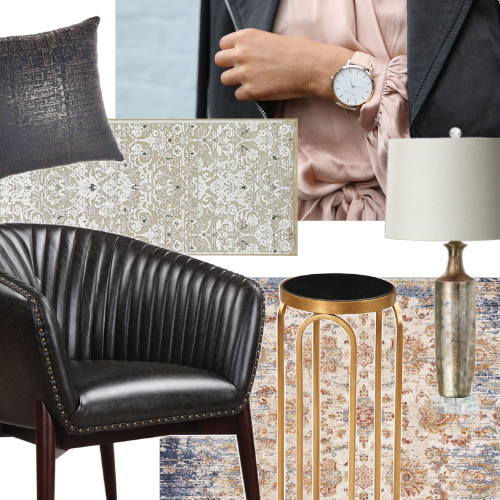 We’re seeing a lot of specific prints and colors like the infusion of Victorian patterns and florals used in both traditional and contemporary spaces. All-white walls are back in more popularity than ever. Akin to an art gallery it really does offer the best backdrop to showcase our art and artful furnishings. The trend I’m most excited about this year is something called Urban Organic. A more livable approach to contemporary design, we’re seeing clean orderly spaces with the visual simplicity of a modern space but with a layering of more natural materials and textures. Working within the same muted color palette knits, linens, leathers, varied woods and stones all play together offering far more warmth and approachability than previous incarnations of contemporary design. Our love affair with all things shiny stainless seems to have run its course. As a designer it’s long been a pet peeve. As kitchen designs became more open-concept we naturally wanted the utility of the space to become more integrated. To do a lovely white kitchen and then add shiny silver appliances only worked to counteract what otherwise could a more visually subtle space. This year the trend towards integrated appliances with panel-fronts or new color options continues to gain in popularity. Samsung’s new Black Stainless finish offers the glam of stainless, with a depth that works beautifully with wood tones and the still popular grey cabinetry. Even the kitchen sink can now be fully integrated. The latest products from Blanco show a white resin sink in a contemporary style that blends beautifully with the still popular white composite counters. Say goodbye to the streaky stainless and hello to bright white everything! We’re also seeing a lot of mixing of materials and elements in kitchen design. 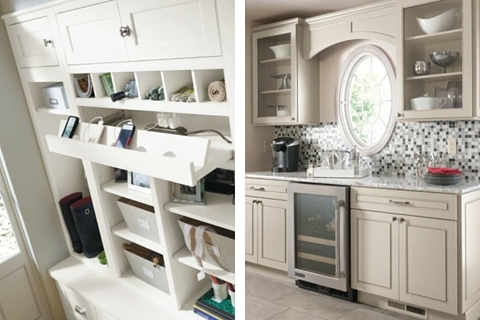 Combinations of open and closed storage, wood shelves on natural stone backsplashes, opting for one material on the island and another on the perimeter and two-toned cabinets are just a few of the ways homeowners are getting creative. Most trends are born of necessity. I think the bathroom trends this year speak to our need to disconnect if only for a short time each day to pamper ourselves. Home bathroom design is all about relaxation. A distinctively spa style from the gentle natural hued material choices to the addition of small perks like heated floors, heated towel racks and steam showers. The growing accessibility of these once luxury items has also worked to grow this trend. If you’re embarking on a bathroom renovation this year consider Nuheat heated floors as an option. The customizable electric pads are so incredibly easy to install and it eliminates the need for additional heaters or vents which in a tight space can make a big difference for planning. Opt for natural stones or one of the maintenance free porcelains that perfectly emulate the real thing. If you’re considering a home update now is the time to research all the latest options out there. Remember your home is your personal haven so look to the trends, but follow your style! Farm girl, urbanite and eternal optimist, Melissa is a creator of physical spaces and all that is required for existing within them. The preeminent expert in achieving maximum ROI and navigating the infamously shaky residential renovation market. Her mandate is to make smart decisions that balance time and budget efficiencies without ever having to compromise on great style. With more than 18 years’ experience in design, construction and real estate as well as holding the position of Art Director & Series Designer for 8 consecutive seasons on the award-winning series Income Property, airing in more than 40+ countries on HGTV and DIY networks. Her work has graced the pages of the country’s top decor magazines, as well as regular television and media appearances, brand representations and speaking engagements as an expert in her field. To view more of Melissa's extraordinary work, visit her website at www.melissadavis.com.